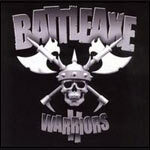 Great BattleAxe compilation. Can't go wrong with these guys. Just quality music. A couple of the classic bangers from other releases such as Fuel Injected, ,Stop Biting, To Make Millions, Temptation, and Smokin In Here. Sweet! Lyrics by: Son Doobie, Moka Only, Swollen Members, Saukrates, Buc Fifty, Abstract Rude, Mr Brady, Murge, and LMNO. Production by: Rob the Viking, Kemo, Moka Only, Saukrates, the Alchemist, Nucleus, Paul Metto, Joey Chavez, and Murge.